Whether your component finishing operation is as routine as surface polishing or burr removal or as complex as final shaping of slots, breakthroughs and drilled hole openings, our Abrasive Flow Machine (AFM) process will meet your needs. The AFM process utilizes an abrasive media applied at high pressure to change the surface characteristics of the machined component. The AFM process is ideal for producing consistent, high-quality finishes, especially for complex internal shapes and targeted surface challenges. A chemically inactive and non-corrosive media, is used to improve the surface finish and edge conditions. The abrasive particles in the media grind away rather than shear off the unwanted material. 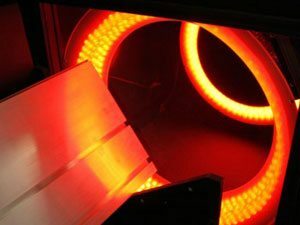 The AFM process controls the media flow rate and pressure, volume and type of media, media temperature, and consequently the amount of material that is removed. For any given application, the material removal rate per unit of volume can be determined and monitored to ensure repeatability. The same type of media can be used on different metals. In many cases, the same batch of media can be used on different metals without transferring removed material between different workpieces. Radiusing: Generating continuous true-edge or rounded-edge radii. Surface Stress Relief: Smoothing out component critical fatigue points and removing stress risers that may lead to crack propagation. Polishing: Uniformly improving the surface finish while preserving the component geometry. Geometry Optimization: Improving entry and exit holes and fine-tuning surfaces to improve the flow characteristics of the finished component. Deburring: Removal of material attached to a component as a result of boring, drilling or cutting operations. AFM is used for surface or edge conditioning of internal, external, and otherwise inaccessible holes, slots, and edges. The process is highly efficient and accurate, is repeatable and can be used in one-way or two-way applications. Versatility. AFM can be applied to any metal material, including titanium, super alloys, and materials that have been hardened or are otherwise difficult to machine. Precision. Component material can be removed from targeted and difficult locations such as cross-drilled and intersecting holes. Process efficiency. 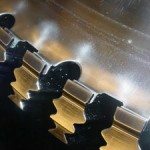 Both workpiece roughing and finishing can be completed in a single pass. Customizability. The abrasive media can be engineered to match the specific application requirements. Quality and repeatability. The AFM process provides process control that delivers consistent quality and high repeatability. Enhanced component performance. The AFM process can improve a component’s air, gas, or liquid flow behavior and reduce or eliminate cavitation tendency. AFM AUTOFLOW: AFM at Its Best. 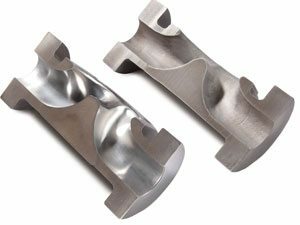 Controlling media flow characteristics during the abrasive flow machining process is critical to maintaining predictable results. 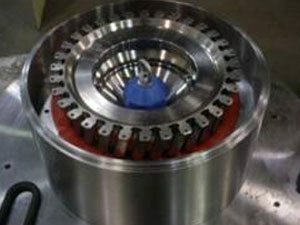 Media temperature, flow rate and viscosity can be a challenge to maintain during conventional abrasive flow machining processes, which can adversely affect the system’s ability to predict processing time as well as overall process results. Our AFM AUTOFLOW minimizes fluctuations in media temperature and viscosity by maintaining a constant media flow rate. Extrusion pressure. The driving force of the advancing cylinder under normal processing conditions. Flow rate. The speed of processing media slug through the workpiece passage. Media temperature. The range of temperature of the media slug during the machining process. Our AFM AUTOFLOW process provides greater control of the abrasive flow machining process to enhance the predictability of your production system, and help control production costs and quality. Consistency. Creates a more uniform flow of media over long passages, complex shapes and multi-part fixtures. Predictability. Provides more predictable processing time, and controllable process results. Economical. Decreases risk of machine and tooling failure from high flow rates and high temperatures, and increases media life due to controlled stresses. Simplifies process scale-up. From single component arrangement to multi-component arrangement. Process improvement. Offers full utilization of the media cylinder cross-section due to placement of media cooling collars on the outside of the cylinder. This creates more area for tooling and parts. Improved performance. Reduces risk of water entering the media from cooler condensation or searing the metal cross pattern, and reduces risk of large temperature changes within short processing periods. Improved process control. Stabilizes media viscosity throughout long process periods. Our AFM Tooling Provides the Edge. The tool (or fixture) is critical to the success of the AFM process, especially when processing intricate surfaces and edges for components in industries such as aerospace and the medical field. With AFM tooling, it is critical that the designed fixture appropriately manage the media pressure in the gap between the fixture and the part. At Extrude Hone we are continuously working to ensure that our tooling solutions perform the task with precision and efficiency. Our team of manufacturing professionals will work with you to determine the best possible AFM tooling design for your project to help you increase productivity while reducing production costs.